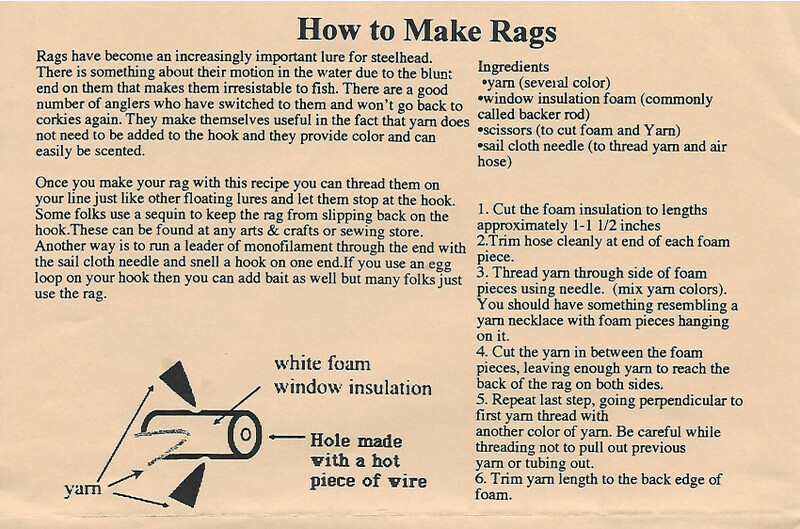 I went to the Steelheaders holiday potluck tonight and heard a presentation on an artificial lure called “rags”. It used a line-wrapped hook (for fish eggs or shrimp tail) with an 18-inch to 22-inch leader, a three-quarter inch piece of cylindrical styrofoam material that is used for window insulation, a small bead or piece of glitter to help keep the styrofoam from sliding over the hook, and two pieces of yarn of different colors. The yarn pieces were threaded through the piece of styrofoam perpendicular to each other and perpendicular to the leader that ran through the length of the styrofoam. A slinky sinker is attached just above the 18-inch or so leader to pull the line to the bottom, and the styrofoam lifts the yarn and hook up off the bottom. 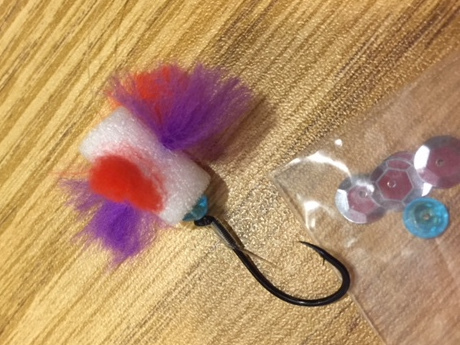 The speaker (Bob Rees, Executive Director of The Association of Northwest Steelheaders and also a fishing guide) advised that you hook a piece of shrimp tail onto the hook so that the barb is down right at the level of the shrimp fan tail. He said you could also attach eggs to the hook instead of shrimp tail, but the shrimp would last a lot longer. He said the styrofoam lure would last up to 40 casts. Some men in the audience also suggested adding some liquid scent to the lure. Following is a photo of the lure attached to the hook and line. He said it is great for steelhead using blue and pink yarn, and red or pink with chartreuse yarn is good for Chinook. He showed us how to thread the yarn through the eye of a needle by pushing a loop of fishing line through the eye first and then pushing the yarn through the loop before pulling the loop of line back through the eye of the needle. He then pushed the needle through six pieces of the Styrofoam perpendicular to the length of the Styrofoam before cutting the yarn between each of the Styrofoam pieces. In that way you can begin to mass-produce several lures at once. 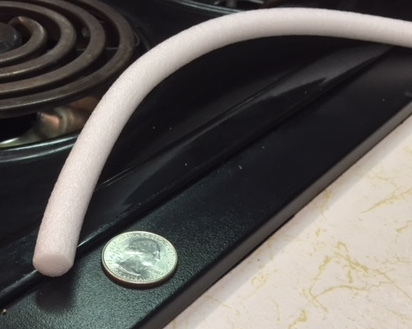 He said for clear water fishing the Styrofoam should be half as long as the three-quarter inch piece shown in this picture. The one in the picture is for water that is somewhat less clear and perhaps flowing more strongly. This entry was posted in Salmon by salemnws. Bookmark the permalink.